Former champions, Espoir Basketball Club, will be seeking to bounce back when they face reigning champions Patriots on January 4 following the 70-69 defeat at the hands of APR last Friday. 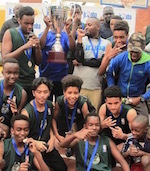 The Nyamirambo-based side, who won the last of their four consecutive league titles in 2015, are third on the log with 8 points, having won three and lost twice in their first five games of the 2018/2019 Bank of Kigali National Basketball League. 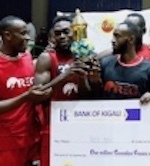 They are three points behind leaders Rwanda Energy Group (REG) and two adrift of second-placed Patriots. The latter, the only side yet to drop points this season, have played one game less. In an interview with Times Sport on Thursday, Espoir head coach Maxime Mwiseneza urged his players to 'remain focused and fear no opponent, we can still win the league title if we win every remaining game all the way to the end of the season.' In the last three years, the green and white outfit have only won one title - the local edition of the 2017 Genocide Memorial Tournament.